Kids (and adults) love pizza and most of them eat a lot of it. Ok, maybe we didn’t need a study to find that out, right? 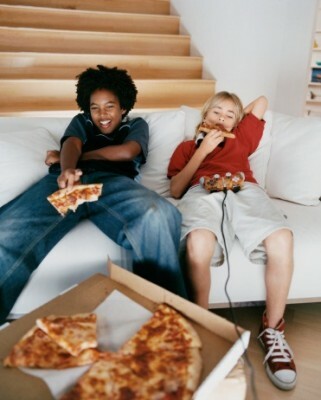 But new research does show how much pizza kids consume and how unhealthy too much of a good thing can be. The study published in the journal Pediatrics focused on kids 2-19 years of age. The data found that pizza is a staple in most kids’ diet, taking in an average of 136 calories per day from pizza and that on any given day, about 20 percent of children and teens eat pizza. This is not surprising, but on the days when children ate pizza that means more saturated fat, salt and calories. On those days when they do have pizza, teens eat 230 more calories per day and younger children average around 84 extra calories. The study was conducted from 2003 to 2010. The bright side of the report was that the amount of pizza consumed during the study decreased by 25 percent. So, what can you do at your house? Theresa Nash, director of Food and Nutritional Services at Cook Children’s, said start by making your own. She offers this recipe for healthy pizza crust that you can find on the Cook Children's Pinterest page. What we commonly refer to as “whoa foods” from the Go-Slow and Whoa plan, should not be a staple in a child’s diet,” Nash said. “Just like a cheeseburger, you should focus on portion size, the type of toppings ordered, the frequency of how often a child or teen is making this type of food his or her meal. For pizza, parents should be aware of the toppings, the crust and the amount and type of cheese your child is eating. Making pizza at home can be extremely easy and healthy, Nash said. The simplest individual pizza can be made using English muffins or flat bread rounds of various flavors. Utilizing a basic pizza sauce with a variety of healthy toppings such as veggies, grilled chicken or other lean meats can make your pizza unique and nourishing. Selecting vegetable toppings such as spinach, broccoli, bell peppers, mushrooms, onions and artichoke are just a few to have available. Going lighter on the amount of cheese, compared with the typical pizzeria and even selecting a ‘lighter” or lower fat version of mozzarella adds to a healthier pie. There are many crust mixes and already prepared thin crusts available for purchase. Gluten free pizza mixes are obtainable if needed. If you going grain free or want to increase your vegetable intake even more, you may make a crust using cauliflower. Thin crust cheese - 388 calories. You save 50 calories and 200 milligrams of sodium by opting for thin over regular crust, without sacrificing flavor. Always choose thin crust, no matter what the topping. Mixed vegetable - 466 calories. Add spinach and broccoli to a thin crust and this is as healthy as restaurant-ordered pizza gets. “Now if only we could lower the sodium, which can add up to approximately 1,020 milligrams per slice,” Nash said. Deep dish (cheese) - 640 calories.Two slices from a 12-inch deep-dish pizza have more than twice the calories, fat and sodium you would get with a thin crust. The works/supreme - 606 calories. We bet you knew it was high, but did you know it would be this high? If you must have meat on your pizza, choose one kind. This meat “works” contains 12 grams of saturated fat and almost 1,400 milligrams of sodium in only two slices. *The study was conducted by the Health Policy Center at the Institute of Health Research and Policy at the University of Illinois at Chicago. Theresa Nash is the director of Food and Nutritional Services at Cook Children’s.Through medical nutrition therapy, a Cook Children's pediatric dietitian can help prevent and manage diseases that affect your child's health, fitness and overall well-being.Cook Children's has registered dietitians and dietetic technicians on staff to help with your child's nutritional needs from birth all the way through the teen years.